The nearest booming but not-quite-metropolis is Fresno, and there are numerous options of places to get outdoor gear and even some specialty river equipment. Outside of Fresno, your chances of finding any useful equipment decrease significantly. REI – Always a good bet. Plus, if you join (for free) you get money back at the end of the year. While they don’t specialize in whitewater gear, they typically have PFD’s, paddles, and maybe even open water canoes in stock. Located at 7810 N. Blackstone Ave., in Fresno. (559) 261-4168. Herb Bauer Sporting Goods is a locally owned outdoor shop in Fresno. 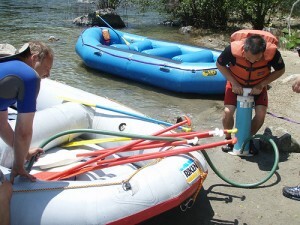 They have some whitewater equipment and rentals as well. Located at 6264 N Blackstone Ave. Fresno. (559) 435-8600. The water is often high on the Kings River, and it’s free-flowing, so even though the weather may be h-o-t, you should still dress for a swim. Wetsuits are a great option because you can always cool off, but you won’t find yourself freezing in the water.